Light live center designed for 2 to 10 lb. workpiece loads. 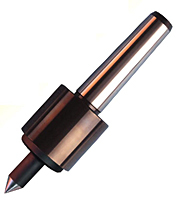 Excellent for very small workpiece. Used in medical, orthopedic, aerospace and similar applications.